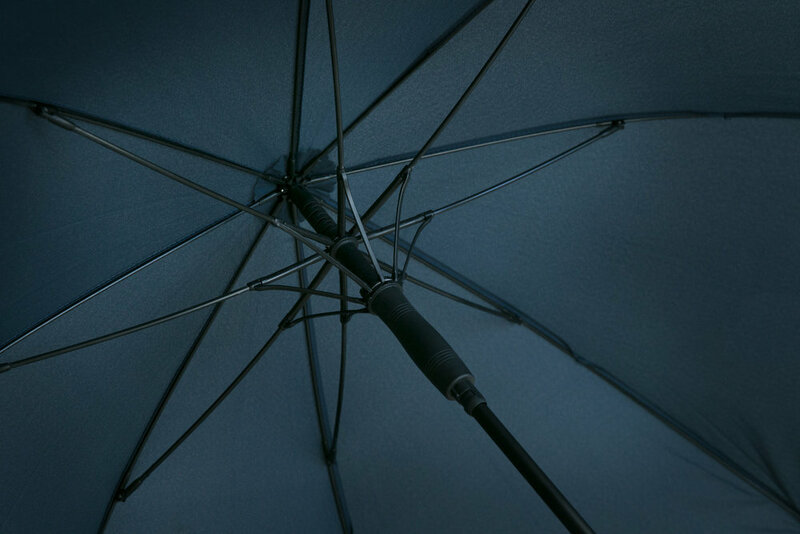 tagUmbrella™ Business Class Executive Umbrellas have been the business world's Umbrella brand of choice for corporate promotions, midtown meetings, uptown concierge services and leading-edge brands since 1988. Printed and shipped from our local North American warehouse stock in a matter of days; or in larger, campaign or promotion-specific quantities from our offshore production center — tagUmbrella™ premium Executive Umbrellas present your brand or organization logo; tastefully, prominently and colorfully according to your standards-of-appearance, on classic traditionally-styled business umbrellas. Our trademark Weathertech™ Invertible frame system features premium quality commercial-grade components designed for maximum durability & longer product life. ALL tagUmbrella™ Business Class Executive Umbrellas feature Auto-Open, industry-leading standard features like our Weathertech™ Invertible frame system, high-density water repellent canopies, fiberglass ribs and printable tie-bands - and are available in a range of classic Modern and Traditional styles. Our trademark Weathertech™ invertible frame system with virtually unbreakable fiberglass ribs & stays is a commercial-duty frame design with added durability and extended product life in mind - these frames can be blown inside out in a windstorm and righted without damage! 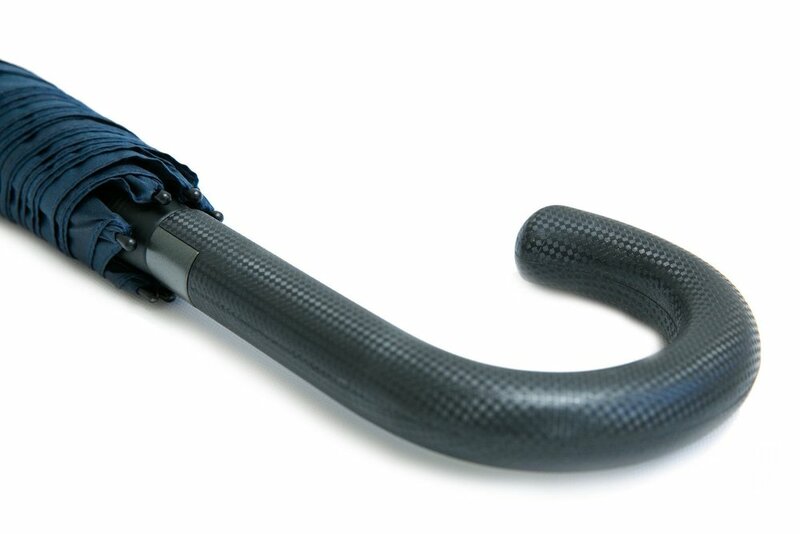 Umbrella handle options include curved, straight and contoured ergonomic designs; carbon-fiber patterns, sustainably-sourced composite, or non-rainforest-wood construction. 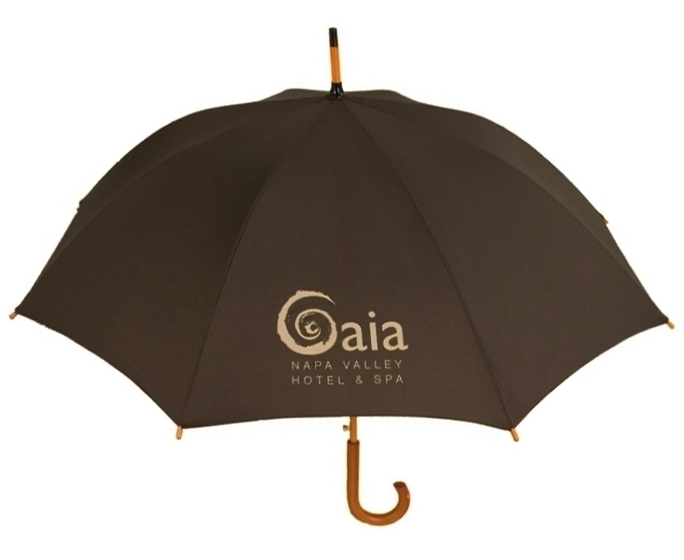 Umbrella print options include single or multiple panel branding; one color to four-color process canopy screen-printing, and digital transfer and offer printing of Velcro tie-band closure strap for an added touch. 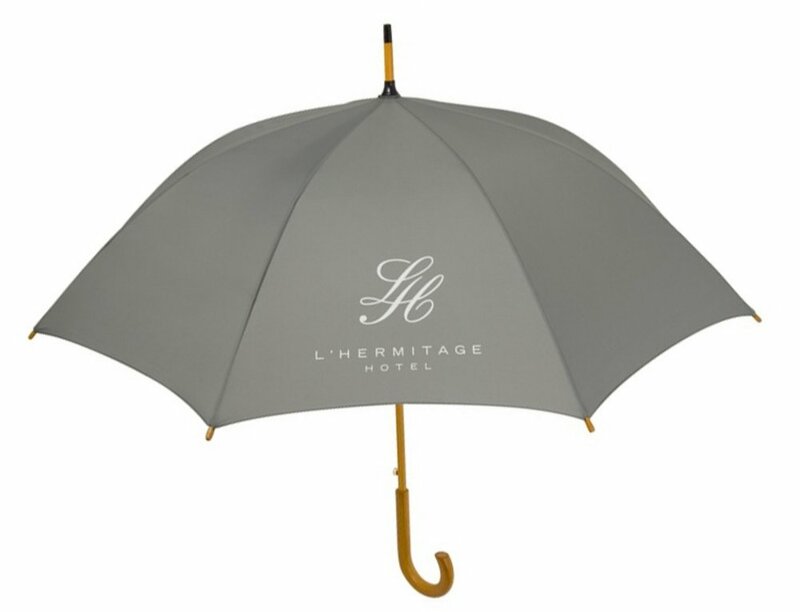 tagUmbrella™ Business Class Executive Umbrellas are perfect premium promotional products for: meeting & presentation gifts, beacons for outdoor tour guides, employee recognition & awards, product launches & promotions, conference gifts, team & school fundraising, events, city tour operators and keeping guests dry at your office or facility. Once you've chosen an item from our Catalog, use our convenient Get-A-Quote form to receive a detailed quote with complete ordering Information including, pricing with current promotions, production lead-time, Artwork Proof and logo approval process. For Wholesale B2B pricing, ordering assistance and further information please use our quick web form to request a quote and we'll send you a written proposal by email including and all the details you need to place an order. Description: tagUmbrella™ Item #8858JB Premium Signature Executive Umbrella features: larger 50" canopy with Auto Open, our trademark Weathertech™ invertible frame system with color-matched matte black anodized aluminum shaft, sustainable woodgrain-design composite handle with integrated auto-open button, high-density textile water repellent canopy, imprintable tie-band with velcro closure. Packaging in clear sleeve. 12/inner carton 24/master carton. Description: tagUmbrella™ Item# 8858JB Premium Signature Executive Umbrella features: larger 50" canopy with Auto Open, our trademark Weathertech™ invertible frame system with color-matched matte black anodized aluminum shaft, sustainable carbon-fiber design checkerboard pattern composite handle with integrated auto-open button, high-density textile water repellent canopy, imprintable tie-band with velcro closure. Packaging in clear sleeve. 12/inner carton 24/master carton. Description: tagUmbrella™ Item #4477 Modern Executive Umbrella features: full size 48" canopy with Auto Open, our trademark Weathertech™ invertible frame system with sturdy windproof fiberglass ribs, color-matched frame, contoured ergonomic handle design with integrated auto-button, high-density textile water repellent canopy, imprintable tie-band with velcro closure. Packaging in clear sleeve. 12/inner carton 24/master carton. Description: tagUmbrella™ Item #4479 Traditional Executive Umbrella with full size 48" canopy features auto push-button opening, traditional curved 'sustainable non-rainforest' genuine wood handle, wood shaft and wooden tips - Improved durable ultra-light frame design now features our trademark Weathertech™ invertible frame system with sturdy windproof fiberglass ribs for extended product life. 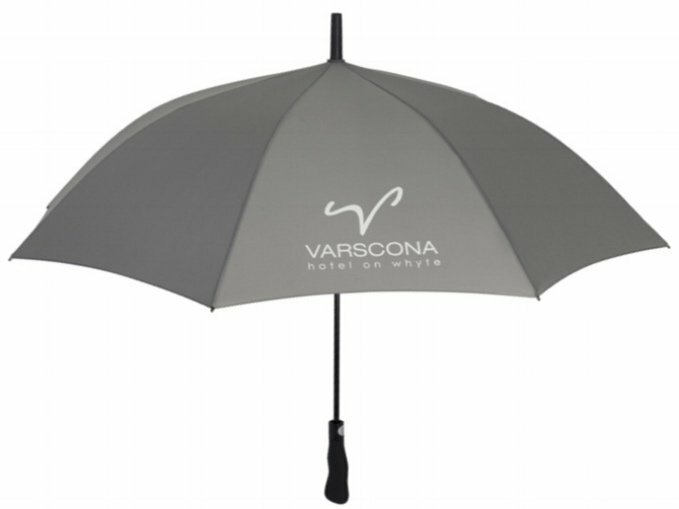 High-density water repellent canopy, imprintable tie-band with velcro closure. Packaging in clear sleeve. 12/inner carton 24/master carton. *Unit pricing shown (below each items' images) is based on local printing from local stock; includes a one color logo on one panel and includes screen set-up charge for a one color logo. Additional imprints are charged at $2.50 each and additional screens are charged at $75.00 per color. Delivery and taxes extra as applicable (no taxes charged on US orders). 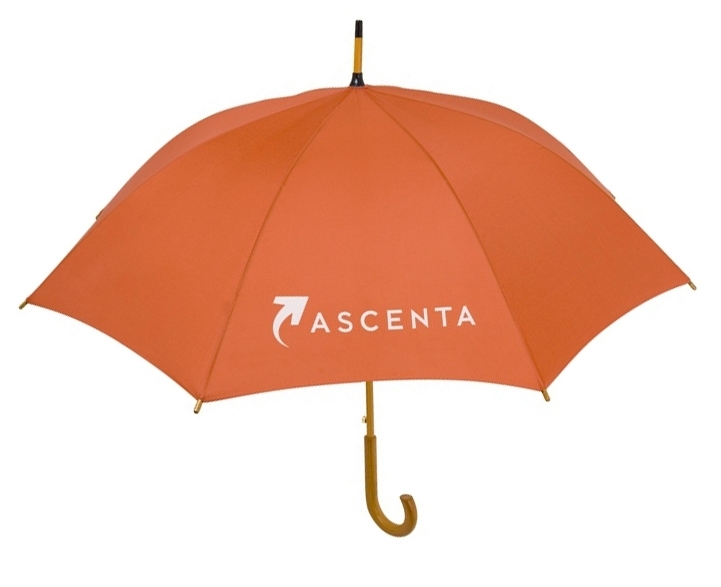 Quantities of 24 to 480 logo-printed executive umbrellas are printed and shipped, usually in a matter of days (outside seasonal peak production periods), from our North American warehouses north of Seattle, WA or Vancouver, BC.